Home › 1/64 Front Tractor Weights, Magnum style SALE 30% OFF! 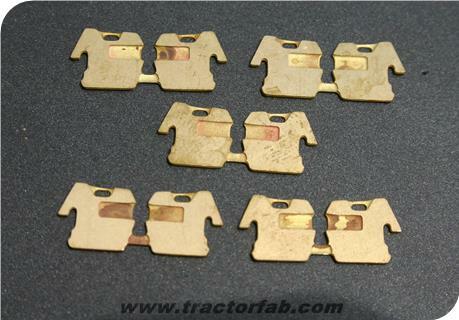 1/64 Front Tractor Weights, Magnum style SALE 30% OFF! Set of 10 front tractor weights for Case IH Magnum, 7000 & 8900 series style. Also used on the 9100, 9200, & 9300 4WD "Red Steiger" tractors. Made from .025" brass, kit includes 5 lefts and 5 rights. This weight is also very similar to the one used on the Case 90 series. (1979-1983+/-) Modify for this variation by installing with the releafs on the inside, and filling the hand holes. Note: The Case 94 series and some early Magnums used a different weight, which we hope to offer at a later date. Front Tractor Weight, Case slab style SALE 30% OFF!